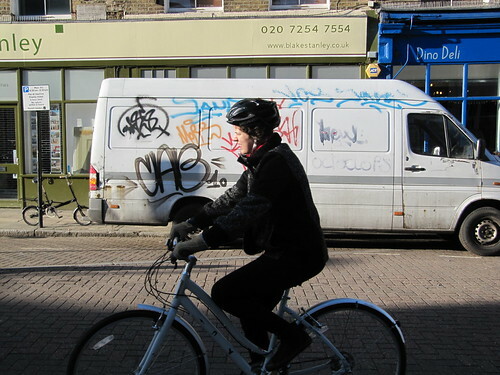 i b i k e l o n d o n: 101 reasons to love cycling in London #29; get some sleep! 101 reasons to love cycling in London #29; get some sleep! Sometimes it is hard to let go of the day and get your head down for a good night's sleep, especially if work is stressing you out or things at home are driving you round the bend. We've all been there, at one point or another, our heads on the pillow and our eyes wide awake, willing ourselves to sleep but to no avail. Researchers at Stanford University School of Medicine in America have found in a study that by encouraging a group of 55 to 75 years old to cycle or engage in similar light exercise for 20 to 30 minutes every other day, that the subject's sleep time was increased by an hour and it took half the time for them to fall asleep. This makes perfect sense in my mind; getting rid of oxygen build ups in your muscles, tiring yourself out a little and clearing your head with gentle repetative pedalling must be a sure way to improve the quality of your Zzzzs. Getting a good night's sleep? It's just #29 of a 101 reasons to love cycling in London! I experienced this myself: cycle touring killed my jetlag within 48h of landing in Germany from Japan. My internal clock is so easily disrupted that normally it would take about a fortnight. It's just like a Tube fare, only more fun. See, I told you I've not been getting enough sleep recently! Yay! 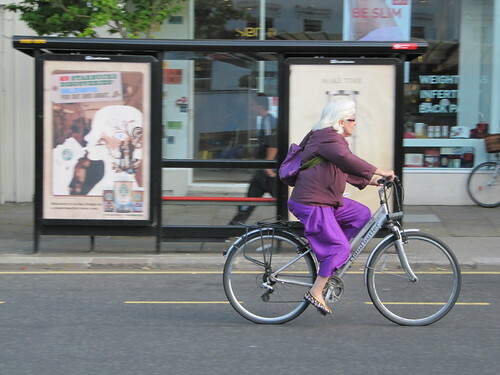 I love the white-haired lady cyclist in her fun purple outfit. I'm more of a gray-haired lady, but I'm 55 and I can attest at least anecdotally that I sleep better and longer than my complaining coworkers, even those ten years younger than me. I definitely attribute that advantage to the calming and invigorating effect of my daily bike commute. Anne, I couldn't agree more - the lady in purple looks fabulous! Off to get some Zzzzzzs now - having written this post last night I had the worse night's sleep ever! When I cycle regularly I sleep better, but I also find I need less sleep... I think that's part of being fitter too.